How does Lawn-Gardening-Tools.com sell Nut Wizards for less than everyone else? I buy in very large quantities and I go to the factory and pick them up myself. Since I get best volume pricing and no shipping costs to me, I pass those savings on to you. I ship everyday from my own warehouse. All orders received by 3:00pm Eastern ship that day! Why pay more to wait longer to get your Nut Wizard? The Nut Wizard is the BEST nut picker-upper I have tested here at Lawn-Gardening-Tools.com. And believe me, I try every wacky nut roller I can find. Which Nut Wizard is Right for You? »Tennis Balls 3/4" to 4"
»Golf Balls 1/2" to 2"
(9 mm and up) 3/8" to 1"
Mini Nut Wizard (wire dumper optional) is becoming wildly popular and we have them at VERY low prices. This is another American made item that I pick up straight from the factory to save you a bundle. The Medium Nut Wizard (wire dumper optional) is a great pecan and English walnut picker-upper. The Large Nut Wizard (wire dumper optional) is excellent for picking up black walnuts, small pine cones and sweet gumballs. We have these in stock with free shipping and same day shipping. New to our product line! The classic Griffith Gatherer! Proudly American made product since 1956! Affordable pecan picker upper! Same classic Griffith Gatherer with a NEW shotgun handle release! Fun and easy to use tool for picking up pine cones! Fast and efficient! 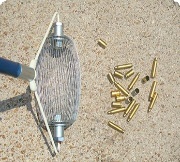 The large wire nut dumper attaches easily to any 5 gallon bucket to use with your Nut Wizard to empty the basket. The small wire nut dumper attaches easily to any 5 gallon bucket so you can push the wire basket of your Nut Wizard over it and release your bounty. Nut Wizard Basket ONLY- No Handle!